We have our club model show and contest in October each year, an official IPMS show. 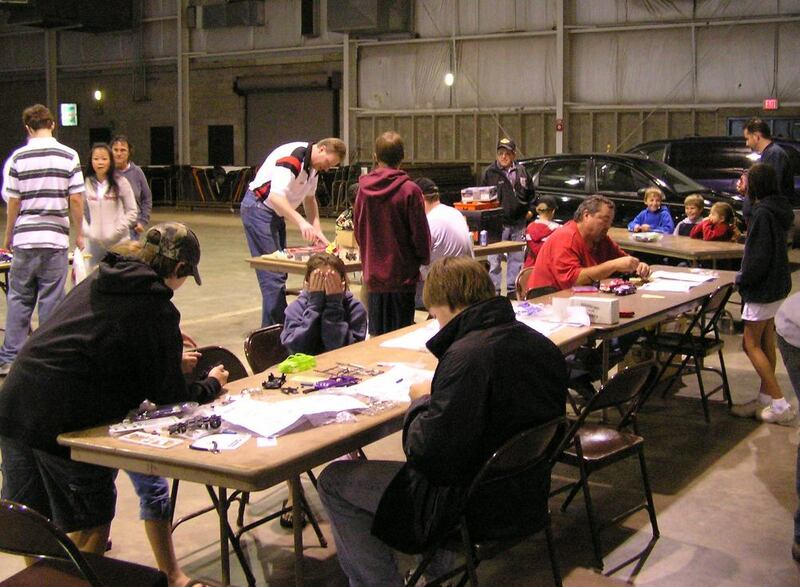 Each year we have had a Make 'N Take as part of the event, usually a table off to the side of the contest room where new or young modelers can sit and build a snap type model, and then take it home with them. 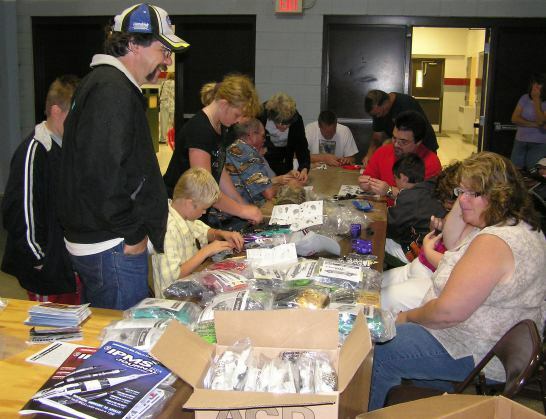 Most of the people at a model show are already familiar with modeling and are more interested in the 1/24 th scale car kits, and more complex aircraft ones. We also help officiate a contest at the Antigo County Fairgrounds that is given by the Badgerland Classics & Customs car club in August. As you might imagine, this contest is automotively themed and draws a hundred plus car and truck models. The classes of models are deliberately biased towards the younger modelers: one category for Juniors, three for Intermediates, and two for adults. That's Juniors, Intermediate Race cars, Intermediate Non-Race cars, and Intermediate Trucks, and Adult Cars, and Adult Trucks. The emphasis is on race cars since the Fairgrounds holds the local racetrack for the area. For the last few years the Glue Crew has been holding a Make 'N Take event at the Badgerland contest. The first few times, attendance was light since we were rather out of the way on the fairgrounds and most of the attendees to the BCC model contest were already builders. That all changed the Year of the Great Rain. Car shows do not thrive in the rain. People do not like to have their spit shined cars rain spotted. Some of the cars date to the earliest years of automotive excellence and their owners feel that 80 years or more of getting rained on was enough. Never the less - it rained. And people were driven indoors for a bit of shelter. We were in the largest volume of covered space available - the multi-purpose building. Suddenly, a few hundred people found us. And the Make 'N Take models. We wound up with 8, 8 foot long tables, half a dozen Glue Crew guys acting as building coaches, and ran out of models. Models for the BCC M'NT, and models set aside for our own show later in the year. At the end, we had to defend our stack of boxed prize kits - the models to be given to the winners of the model contest - from prospective builders. I think we wound up with 3 pre-painted 1/100 th airplane models left over for "our" own contest! Since then, people have known where to find us. And mercifully, the IPMS has been instrumental in supplying us with snap kits. 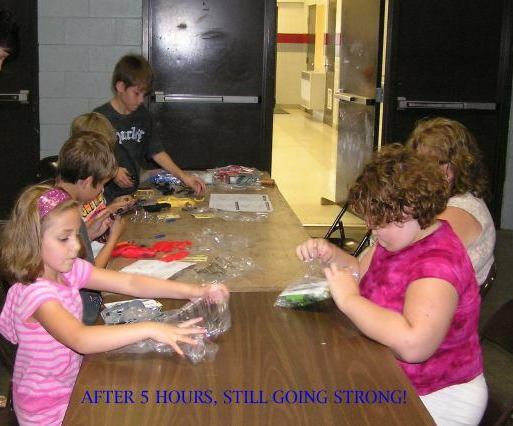 Those folks - kids and adults - can go through lot of kits in 5 hours! Thanks to the IPMS and the contributing model companies for all the help in the last years!